Please refer to our stock # 3158 when inquiring. 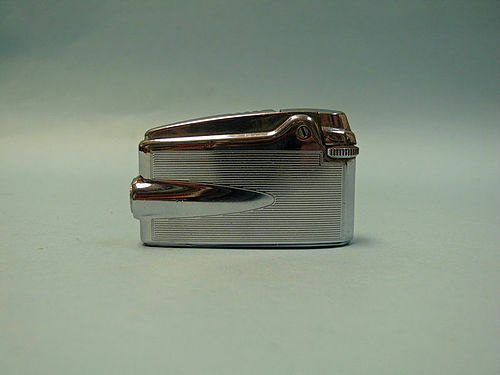 In Need of Repair: A vintage Ronson Varaflame lighter made in Woodbridge, NJ in the 1950s. Chromium plated with deco design on both sides. Ronson has a long and illustrious history of producing high quality cigar and cigarette lighters as well as stylish smoking accessories and Art items for home, office and commercial use. The Company was created by Louis V. Aronson, et al, in 1897 and was incorporated in 1898, in Newark, N.J. Ronson debuted several user-friendly enhancements with the Varaflame, most notably finger screw access to the flint chamber on the base and fuel chamber at the rear. In addition to their strong Art Deco contribution, Ronson also produced artistic metal wares for Commercial advertising, School & Fraternal organizations and for the Military. Some of the variety of products include, Ashtrays, Automobile Mascots, Book Ends, Busts, Cigarette Boxes & Humidors, Cigarette Dispensers, Desk Sets, Electric Lamps & Candelabra, Incense Burners, Military Metals & Buttons, Paper Weights, Pen Trays, Perfume Misters, Picture Frames, Religious Goods, Sparking Toys, Statues, Trophies, Wall Plaques and of course Lighters.